The highway system in our country is run by the government and not privately owned. In order to be able to use it, each vehicle has to pay a yearly fee of CHF 40.- and stick the yearly label that comes along with it on to the front window. This fee isn’t small if you are just passing through the country. However it isn’t much if you use the road system the whole year round. The state keeps the road infrastructure in a good state and works on extending the present system. Since Switzerland is a place of many mountains there are also many tunnels cutting right through the mountains. In Switzerland the highway signs are all in green. Each section of the highway has its own number. Using a gps system the number is usually indicated for a change of direction along with the name of a destination. Most of the highway runs just two lanes for each side. Only around bigger population centres there are three or sometimes even four lanes available. 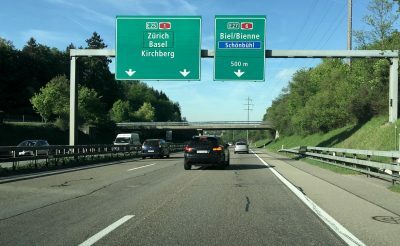 The speed limit on the Swiss Highways is 120km / h.
During rush hour especially in the greater Zurich area there are quite some traffic jams. In comparison however with the world’s mega cities, even in Zürich and more so in Berne or many other Swiss cities the jams are quite moderate! Switzerland is still known to be one of the cleanest countries in the world. The Swiss are very particular about the environment. Traditionally everything needs to be proper and clean. Household waste is meticulously separated and collected almost at your front door. In most places general waste is collected twice a week. In the city of Berne a particular bag has to be used where the price for a specific amount of waste is included in the price. Other places use labels to be stuck on the bag, thus paying for the service of waste removal. 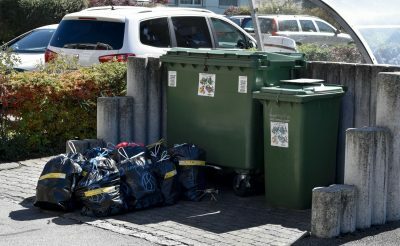 However there are other regular collections too: during summer time biological or green waste (leaves, branches cut grass) is also placed in green containers and gets collected once a week. This service also is paid by label. On another weekly day paper gets picked up for free or metal and tin. Empty batteries get collected at all shopping places along with empty plastic bottles. Glas gets separated into three different categories: brown, white and green. The collection of these items are free. Bigger shopping areas offer such glas collection points. Every city also has collection points for bigger and bulkier stuff. You can bring the things you want to throw away to these centres. Again, stuff gets separated according to categories: general waste, glas, metal, batteries, organic etc. People who secretly deposit waste will certainly face a huge fine, if caught. There are written the regulations on how waste is handled. In the city of Berne they are available in the following languages: Albanian, Arabic, German, English, French, Italian, Portuguese, Serbian, Spanish, Tamil and Turkish. That just offers a glimpse of the languages that are really quite commonly spoken in the city of Berne. The general waste gets collected and is then burned in very efficient plants. 725 years ago (in 1291) the three cantons Uri, Schwyz and Unterwalden swore an oath of Confederation. This was the beginning of Switzerland. Nowadays 26 cantons belong to the Swiss Confederacy. The Swiss National Day is one of the official public holidays where people are off work. I attended a celebration in Oberhofen at the lake of Thun. It started at 9 am with Alphorn blowing and swinging of flags. The peak was a speech held by a now retired very high ranking army officer. 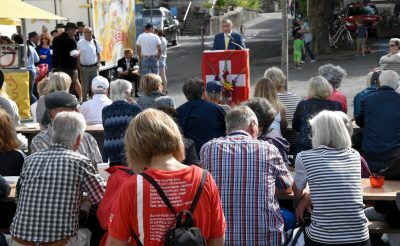 Mr Faustus Furrer noted how peaceful and blessed Switzerland is the midst of so many conflicts past and present in the world around us. He encouraged the listeners to hold on to the values that shaped our country. At the end the national anthem was sung which gives glory to God, who is blessing the nation. In the evening many Swiss will enjoy a barbecue with family and friends. There are many fireworks taking place. The one on lake of Thun is famous. 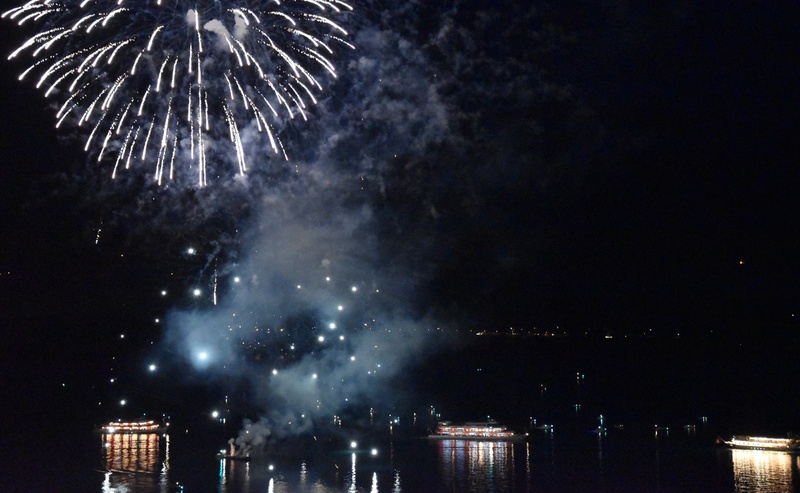 At 10pm the five big boats of the lake will pass by the bigger villages, stop and send beautiful fireworks into the sky. 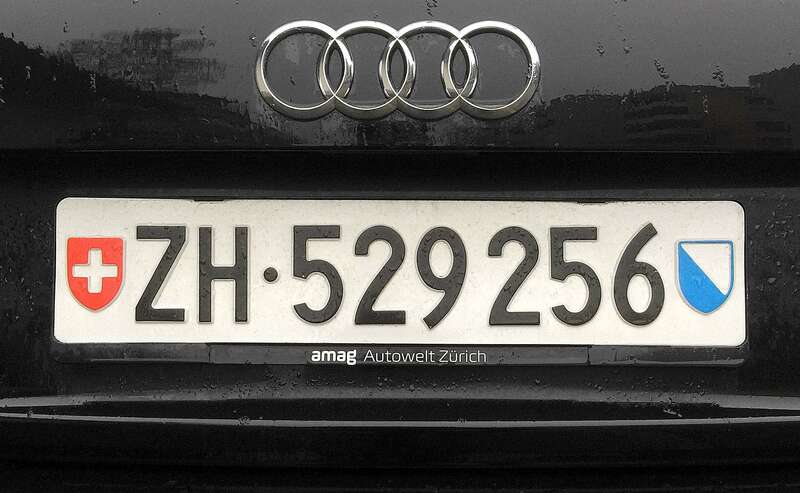 On our Swiss number plates the flag of Switzerland is on the left and the one of the canton on the right. This canton is one of my favorites. It is a smaller french speaking protestant canton with a population of only about 180’000 people. The city of Neuchâtel is located on the lake bearing the same name. Along the lake many vineyards grace the countryside. Behind the lake the Jura rises up with beautiful valleys such as the Val de Travers and the Val de Ruz. In the Jura of Neuchâtel there are the two bigger cities located: La-Chaux-de-Fonds and Le Locle. The border of France is very close to both of these cities. The highest peak is the Chasseral (1600m) with a tremendous view across the three lakes below and the whole range of the alps on the horizon. One particular attraction is the „Grand Canyon of Switzerland“ or le Creux-du-Van. In the middle ages Neuchâtel was part of the kingdom of Burgundy. Around the year 1000 the German emperor Rudolf II inherited the canton. In 1308 Neuchâtel and Bern made a first pact. By 1530 under the influence of the reformer Guillaume Farel (sent by Bern) Neuchâtel turned protestant. In the later troubles of the reformation many Huguenots found refuge in the sparsely populated Jura mountains of the canton. At the beginning of the 19th century Napoleon took Fribourg and Bern but left Neuchâtel almost untouched. The Canton only fully joined the Swiss Federation in 1815. Neuchâtel is just 3/4 hour car drive from Bern. The city has an elegant flair along with the easy going French speaking culture. The mix of the lake, city and the beautiful Jura are unique. 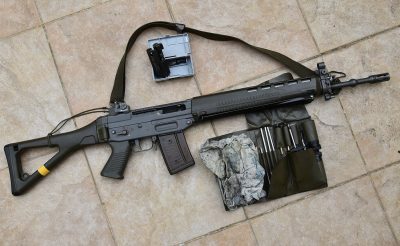 The SIG SG550 is the standard Swiss Army’s assault rifle. It is the weapon that many adult Swiss males keep at home. Officers and some specific troops are issued a pistol (SIG Saurer P220). Every healthy 18 year old Swiss male living in Switzerland is conscripted and has to go through basic army training (RS, Rekrutenschule) that takes 18 or 21 weeks. After the basic training every year soldiers have to go on a three weeks repetitions course (WK, Wiederholungskurse). Nowadays men who for some personal reason don’t want to join the Swiss armed forces have the option of serving with a longer civil service (serving in old people’s homes and hospitals etc). I remember the days when we were drafted, people refusing to join had to go to prison. Women are free to join the ranks too. Their proportion is not big, but there are ladies serving in the same troops along with the guys. The army weapons have to be practiced at least once a year at the official shooting ranges. After having served a certain number of days and having reaching a certain age the soldiers are taken out of service. Many would opt to keep their weapons. People keep their army weapons at home. The bolt has to be kept separately and should be locked away. Switzerland has quite a liberal weapons law. It is relatively easy to buy a gun. There are around 2.3 to 4.5 million weapons privately owned. In that aspect Switzerland is probably not lagging far behind the US. However it is quite amazing that firearms are relatively rarely used to commit crimes. Unfortunately weapons are often used in suicides. Between 1996 and 2005 over 40% of suicides were committed with army weapons. On the car registration plates as always the flag of the Canton is on the right (blue and white) and the Swiss flag on the left. This canton is not one of the biggest but the most populated. It covers basically the city of Zürich with agglomeration. It’s population reaches 1.4 Mio. It is located in the eastern part of Switzerland. Folks from that Canton are probably the most sophisticated in terms of fashion and trends. The people from Zürich speak Swiss German with their particular Zürich dialect. The standing joke is, that they are fast moving and rapid speakers, especially in comparison with the slow folks from the canton of Berne. In the canton of Berne people think that those from Zürich are somewhat big mouthed. The canton is seat to many international companies of Swiss origin (ABB, Credit Suisse, Helsana, Migros, Sulzer, Swiss Life, UBS etc) or foreign origin (Bayer, BMW, Esso, GE, GM, Microsoft, Sony etc). This canton is the economic power house of Switzerland. The university of Zürich and the ETH rank among the world’s top places of education. The lake of Zürich and a few smaller lakes are part of the Canton, adding to its beauty. On the last weekend of February the Swiss are called to cast their ballots on four different issues. 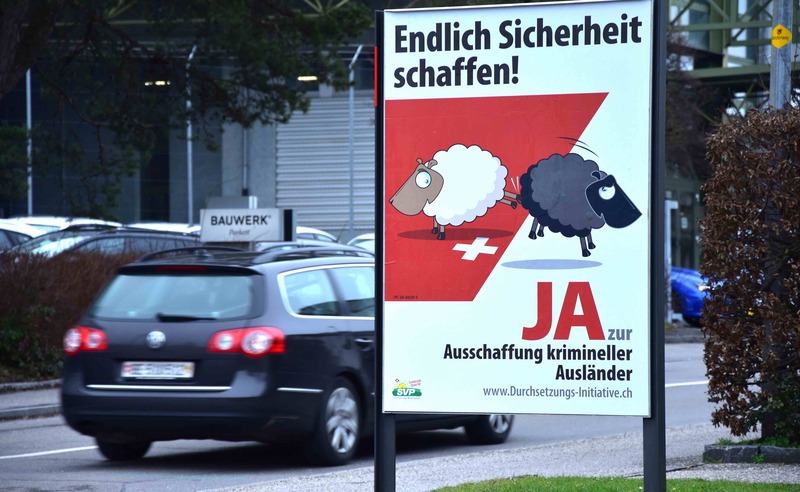 The most controversial one pictures the peaceful Swiss (the white sheep) kicking out all foreigners who are criminal offenders (the black sheep). For many decades Switzerland has experienced a steady influx of foreigners. In the 60ies a wave of Italians arrived who came for construction labour. Later refugees from Vietnam, Tibet, Sri Lanka, the Balkan countries, Africa and other countries applied for asylum. However there are also many Europeans (Germans, French, Italians etc) working in Switzerland (about 2/3 of all foreigners). According to the official statistics the foreign population is around 15% (others even claim 25%). Foreign tourists are most welcome. However, nowadays many Swiss are quite sensitive about the growing number of foreigners residing in Switzerland. And now, to make matters worse, scores of refugees are pouring into Europe. Many Swiss are really alarmed. They feel that our small country can’t cope with this huge influx. There are fears that the many Muslims arriving here will not integrate easily and cause trouble. Indeed, 73% of the prison population consists of foreigners. The billboard above reads: “Finally let’s achieve security!” (German: Endlich Sicherheit schaffen). At the same time many Swiss are genuinely touched by the suffering and misery of the many new refugees seeking shelter in Switzerland. The major political parties as well as the government are against this initiative. They say that there are enough laws in place to deal with delinquent foreigners and that such a new constitutional law would violate international law. The Swiss democratic system is very direct! Any citizen can try to bring about a change in the constitutional law with a referendum or bring in a new one through a federal popular initiative. All that is needed are at least 100’000 valid signatures within 1 ½ years for an initiative or 55’000 valid signatures within a hundred days for a referendum. When that target is reached it takes a little while. But then the Swiss are called to cast their ballots on the issue. For years the Swiss government wanted the country to join the EU. The Swiss have resisted these moves. That is certainly one area where the direct democracy has made a difference. However in reality the Swiss reject most initiatives or referendums. This democratic process is one of the main reasons for the political stability of Switzerland. Addendum: The initiative above was rejected by 58.9%. 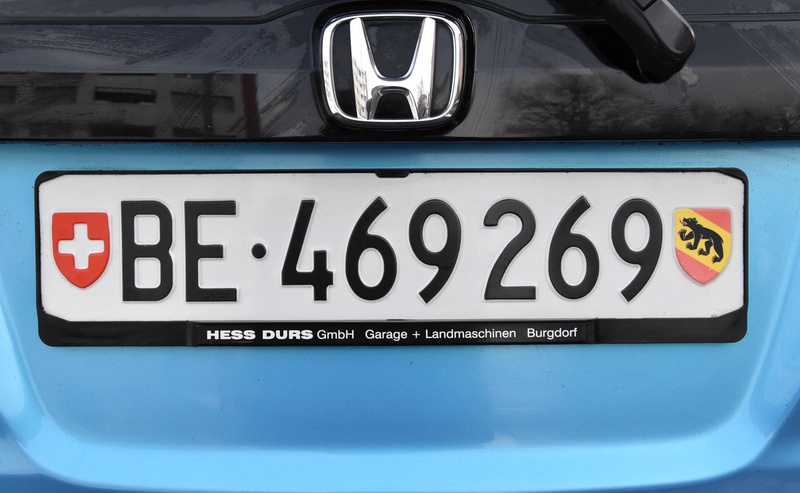 All cars that are registered in Switzerland have to display the typical Swiss license plates. The license plate shows that the car is Swiss (watch out for the Swiss flag on the left hand side) and the flag of the canton (on the right). This car here is from the canton of Berne (BE). The canton of Berne is the second largest of the 26 cantons in terms of population with just a little over 1 mio inhabitants. It is also the second largest in terms of surface (just barely 6’000m2). Car license numbers go up to just under 1 Mio. 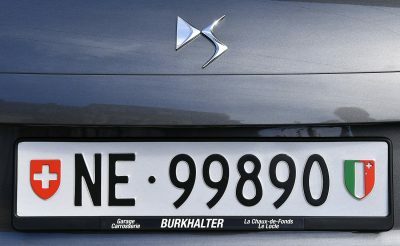 Lower number plates (under 100’000) are perceived as more prestigious. Low numbers can be especially purchased. The lower and ‘nicer’ the number the more expensive it tends to be. The Canton of Berne is bilingual. About 85% speak Swiss German (a more melodious Swiss German dialect) and about 15% are French speaking Swiss. However around 15% of the population of the canton consists of residential foreigners without a Swiss passport, speaking many different languages. The canton is rather a protestant area. A bear is the in the flag of the canton. The story goes that at the beginning days of the city of Berne, by 1191 the founder Berthold von Zähringen killed a bear on his first hunt in the area. The canton of Berne joined the Swiss Federation in 1353. The canton has a colorful history with a roman period, the middle ages, the Burgundian wars in (15C), the reformation and a Napoleonic period (19C). The canton of Berne has a very varied topography with the alps (quite an impressive mountain range up to 4000m), several lakes surrounded by fruitful farmland, rolling hills (the Emmental) and the Jura (a lower mountain range in the North). There are countless beautiful spots within a very small area that most foreign tourists would never get to see. The capital of Switzerland is the city of Berne. The canton connects the German and the French speaking areas of Switzerland. Quite a few famous watch companies along with other high tech brands are located in the canton of Berne. Tourism is also important with key sites such as Interlaken and the Jungfraujoch station (or the top of Europa, at 3’454m). Also check out our post on the Niesen. In that area is so much exciting stuff to do!